'One Of The Darkest Hours': Sri Lanka Roiled By Prime Minister's Abrupt Dismissal President Maithripala Sirisena fired and replaced his former ally with a controversial former leader, Mahinda Rajapaksa. But lawmakers have rejected what they call a subversion of the constitution. 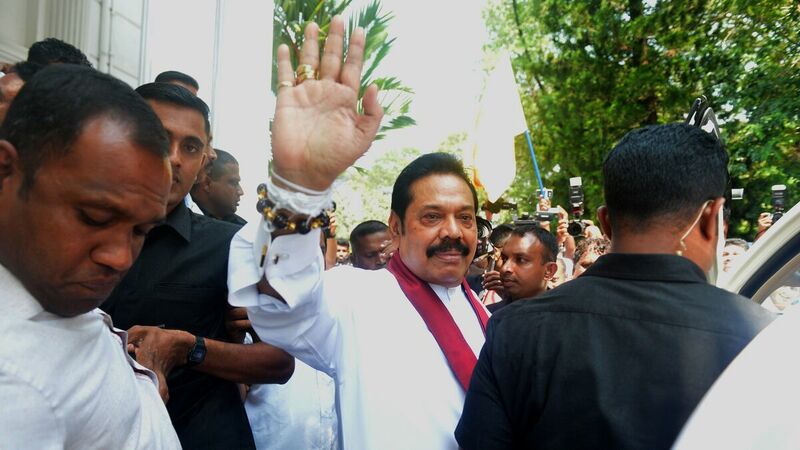 Sri Lanka's newly appointed prime minister, Mahinda Rajapaksa, waves to supporters Monday in the capital, Colombo. The man he intends replace, Ranil Wickremesinghe, demanded that lawmakers be allowed to end his standoff with the country's president. Just days after Sri Lanka's president abruptly dismissed its prime minister and his cabinet, replacing him with a former leader, the country's upper echelons of power appear deadlocked in an increasingly bitter tug-of-war. Many lawmakers are decrying the move as unconstitutional, and those calls only grew louder when President Maithripala Sirisena suspended Parliament over the weekend. The man he sacked Friday, Ranil Wickremesinghe, has refused to cede his office to Sirisena's appointed replacement — despite the fact that Mahinda Rajapaksa, a former strongman president and Sirisena's erstwhile rival, was hastily sworn in to replace Wickremesinghe as prime minister not long after the firing. "As the Prime Minister of Sri Lanka, I call upon all parties to assemble in parliament to regain our country's peace, stability, and to vehemently defend the fundamental rights of our citizens," Wickremesinghe said in a defiant statement posted to Facebook on Monday. "My expectation is that the Speaker [of Parliament] will exercise his constitutional rights and summon parliament within the next 2 days." It is unclear if Sirisena would have a majority backing his decision when the body reconvenes. The president announced that Parliament will remain closed through mid-November, in an apparent bid to consolidate support among lawmakers. Wickremesinghe said that 126 lawmakers — or a solid majority of the 225-seat Parliament — had signed a letter demanding that Speaker of Parliament Karu Jayasuriya reopen the lawmaking body immediately. Jayasuriya himself has also expressed misgivings about a possible end-run around members of Parliament. "We need to solve this through parliament," he said, according to a translation by the Guardian. "If we try to solve this in the streets it will lead to a major bloodbath." Indeed, deadly violence already erupted Sunday in the capital, Colombo. The bodyguards of Wickremesinghe's deposed oil minister, Arjuna Ranatunga, opened fire on a throng of Sirisena supporters who had been blocking his access into a government building. One person was killed and three others injured in the ensuing chaos outside the headquarters of the state-run oil and gas company, the Ceylon Petroleum Corporation. One of the bodyguards was taken into custody after the shooting, and Ranatunga himself was briefly detained before being released on bail. 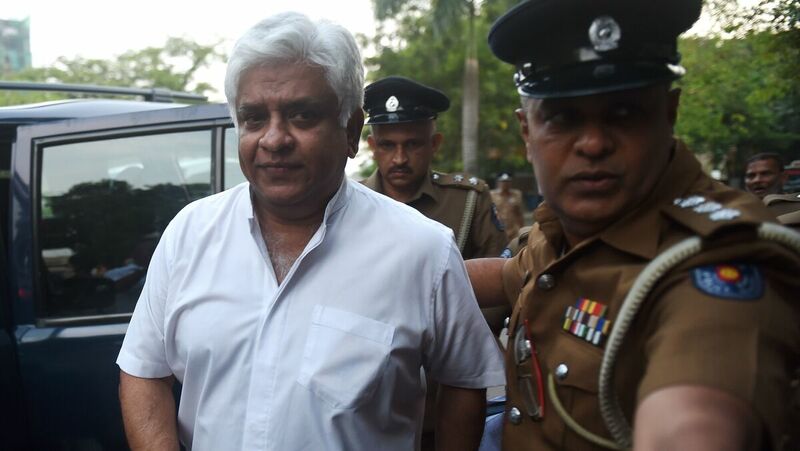 Ranatunga defended his guards' actions, saying the crowd was threatening him with violence. Police arrest Arjuna Ranatunga, Sri Lanka's petroleum minister and former cricket star, in Colombo on Monday. The arrest followed a confrontation in which his bodyguards opened fire on a group of protesters loyal to the president. It was the threat of bloodshed that prompted Sirisena's surprise shakeup, according to the president and his appointed prime minister. Sirisena has claimed that cabinet members were involved in a plan to kill him. "Details of a plot to assassinate the President and the former Defence Secretary have come to light," Rajapaksa asserted in a statement Sunday. "I was aware that at this moment of national peril, the people expected our leadership and protection," he added. "Hence, I accepted the invitation extended to me by the President to assume the position of Prime Minister." For Rajapaksa, the move marks a return to power. After a decade as president, during which he presided over the end of a protracted civil war and accrued a dubious human rights record, Rajapaksa narrowly lost to Sirisena in the 2015 presidential election. But since Sirisena's fragile coalition won, the threads that bound it have frayed and loosened amid policy disputes between the president and Wickremesinghe. And as they grew more distant, Sirisena found a fresh ally in an old foe, embracing Rajapaksa despite lingering allegations of war crimes and corruption. The upheaval in the small island nation has attracted the attention of major international onlookers, including the U.S.
"We urge all sides to refrain from intimidation and violence," the State Department said in a statement Sunday. "We call on the President, in consultation with the Speaker, to immediately reconvene parliament and allow the democratically elected representatives of the Sri Lankan people to fulfill their responsibility to affirm who will lead their government." Few countries have as much invested in Sri Lanka as China, which has sought to woo the country into its sphere of influence — and away from neighboring India's — by pumping money into huge construction projects such as the Hambantota port. "As a friendly neighbor to Sri Lanka, China has been closely following the situation," a spokesman for the Chinese foreign ministry, Lu Kang, told reporters Monday. "We follow the principle of non-interference in other countries' domestic affairs. We believe that the Sri Lankan government, parties and people have the wits and ways needed to deal with the domestic situation." He noted that Chinese officials met with both sides over the weekend. Wickremesinghe's allies, for their part, see the matter as more than a simple political disagreement. "What we have been witnessing since last Friday evening has been one of the darkest hours of the history of Democracy of this country," as one member of Wickremesinghe's party put it. "Democratic institutions cannot fail. Democratic processes of a country cannot fail," Champika Ranawaka wrote Monday. "This is simply because it is the whole nation, the whole future of many generations, and the very lives of our people, that are at stake, that are in grave danger, when the democratic processes fail."